Crosley Radio's products have a distinctive, appealingly retro look. The $400 CR2413A Memory Master that I tested in­­cludes a turntable (33, 45, and 78 rpm), a cassette player, an FM radio, a CD player, and auxiliary line-level stereo audio inputs for other audio devices such as MP3 players--all of them recordable to your PC via a USB connection. 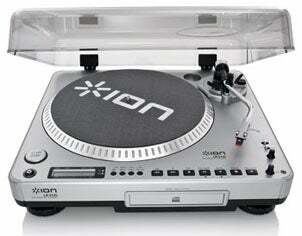 Alas, the quality of the unit's components (especially the turntable) was a tad disappointing. The digitized sound was decent, but again, it did not approach audiophile quality. Ion LP 2 CD is a turntable with USB connections for analog-to-digital audio conversion; the unit subsequently transfers digitized recordings to your PC via USB cable. Cakewalk Pyro Audio Creator 1.5 ($40) is a program designed specifically for digitizing analog music. The biggest problem with analog audio is noise, which gets digitized along with the music. Vinyl suffers from clicks, pops, and scratchiness, while hiss plagues tape. Recording apps such as Audacity include restoration features that can help remove the noise, but they're difficult to use and can kill the dynamic range of your music if you use them improperly. Most commercial high-end sound editors such as Adobe's $349 Audition 3 provide effective noise removal. If you want the best restoration software, however, you should look to either Bias's $129 SoundSoap 2 or iZotope's $349 RX 2. In my tests, I found SoundSoap 2 simple to use, and the audio files that I created with it sounded great. Nevertheless, I got even better results from RX 2, which created audio that blew me away, especially during quiet passages. *A lower number means less resistance and better conductivity. The big players in music OCR are Neuratron with its $49 PhotoScore Midi Lite 5 and $249 PhotoScore Ultimate 6, and Musitek with its $49 SmartScore Midi and $399 SmartScore X Pro. They not only create MIDI files, but create notation and allow you to edit that notation. Scan your pictures--film and slides--into your hard drive with the right hardware and software.